The riders dream of their horse grazing under their bedroom window comes true at this 400-acre working farm in the beautiful green rolling hills of the Scottish Borders. You will be warmly welcomed and cared for in this charming farmhouse B&B offering three cosy letting rooms with log fire and a self-catering cottage. The converted barn is now a cashmere knitwear shop and art gallery and there is a good choice of local pubs and restaurants in nearby Hawick. A delightful working farm with paddocks and stables adjacent to the beautiful farmhouse. There are three stables to choose from with extra compartments in sheep shed if required. Good quality grazing is available in view of the farmhouse and rough grazing in front of the traditional self-catering cottage. Part of the fencing is Rylock netting, please bring your own electric fencing if you prefer. Hay and straw can be provided. Secure storage for tack and ample parking space. 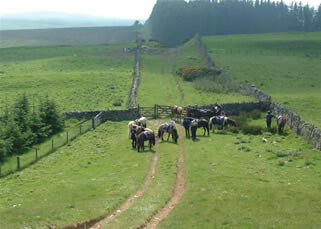 Price range: From £10 per horse per night. Feel yourself wind down to the more leisurely Borders pace in this peaceful and picturesque farmhouse B&B set in a lovely sheltered valley in 400-acres of grazing, woodland and gardens. There are three cosy bedrooms to choose from - 1 Twin, 1 Double and 1 Family bedroom with ensuite bathroom (VisitScotland 3 Star). The pretty semi detached self-catering cottage sleeps up to 6 and offers total peace from noise and traffic. Why not say good morning to your horse from your bed and share breakfast over the fence! 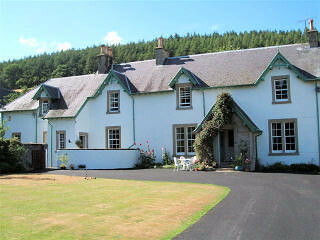 Price range: From £25 per person per night. Right on the Hawick Circular Route, one of the Buccleuch Country Rides, which links to 350km South of Scotland Countryside Trails network. Enjoy miles and miles of exhilarating rides with glorious views of the hills. Owner happy to give advise on local hacking. Follow brown signs for Wiltonburn Country Cashmere and Farmstay signs on A7. Take the A7 out of Hawick towards Carlisle for one mile. Turn right onto the B711 sign posted Roberton Road. Turn immediately right again after crossing the bridge. Follow the road along the riverside, keeping left around the corner and straight on through the "no through road" sign, and on for half a mile to the end of the road. Keep Wiltonburn white farmhouse and shop on your right, then keep left past the cattle shed to the end of the track for holiday cottages.